During a wildland fire, local animal rescue organizations work with law enforcement and fire departments to rescue as many animals as they can. In battling a wildfire, firefighters will do what they can but they are not responsible for evacuating your livestock. Cold weather can be deadly for pets. … One of the most common forms of animal cruelty, cases of animals left outside in dangerous weather are investigated more by police and animal control agencies than any other form of animal abuse. If you haven’t been thrown for a loop by President Trump before, this should surely do it. Okay, now this story is pretty bizarre – even for us. . . If you aren’t familiar with the story of Andrew Thornton II, we’ll try to give you a quick run-down. Andrew was an ordinary farm kid from Kentucky. He got into trouble as a youngster, and eventually found himself in a military academy. After that, he became a Lexington narcotics police officer. We’ll see the irony of this later on. . .
Once he served time busting people on drug charges, he then became a practicing Lexington lawyer. Some even believe Thornton strategically planned his time on the “right side of the law” to help bridge connections with other shady characters across the globe. According to Kentucky for Kentucky, in 1981, Thornton had been accused of stealing weapons from a California naval base, and conspiring to smuggle half a ton of marijuana into the U.S. He was somehow able to evade those felony charges though, and got off only having to pay a small fine and spend 6 months in prison, on top of a suspended license. You’re probably wondering by now, why we’re talking about this man and his trouble making ways, but bare with us, because this story is about to get turned on it’s head. . .
See, in 1985, Thornton had stepped up his criminal activities in a major way, and had been making regular trips to Columbia to smuggle cocaine into the U.S.
During one of those runs, Thornton reportedly had a parachuting accident, and fell to his death in some guy’s yard in Knoxville, Tennessee. Apparently when they found his body, he had on night vision goggles, a bulletproof vest and Gucci loafers on his feet. He also had $4500 in cash casually jammed in his pockets. Oh yeah, and there was also a duffel bag with roughly 75 pounds of cocaine in it. This is where things get weird. . .
About three months after Thornton’s death, the body of a black bear was discovered in Georgia’s Chattahoochee National Forest. You don’t need to be an expert to know that’s a lot of blow for a bear to get it’s paws on. Just imagine how this went down; The bear was probably rummaging through the forest feasting on berries and bugs, when suddenly it was raging through the trees, and tripping off Columbian star dust. Ky for Ky did some further poking around for this story, and we’re so glad that they did. Eventually they got in contact with the actual medical examiner (who’s now retired) who performed the bear’s necropsy and the memory of the cocaine bear was still fresh in his mind. The bear’s body was apparently in good shape though, so the examiner thought it would be a waste to have it cremated. He made some phone calls, had it taxidermised by a friend, and then gifted the animal to the Chattahoochee River National Recreation Area. Cocaine bear sat on display in the visitor center for a while, before mysteriously disappearing along with a handful of other artifacts. 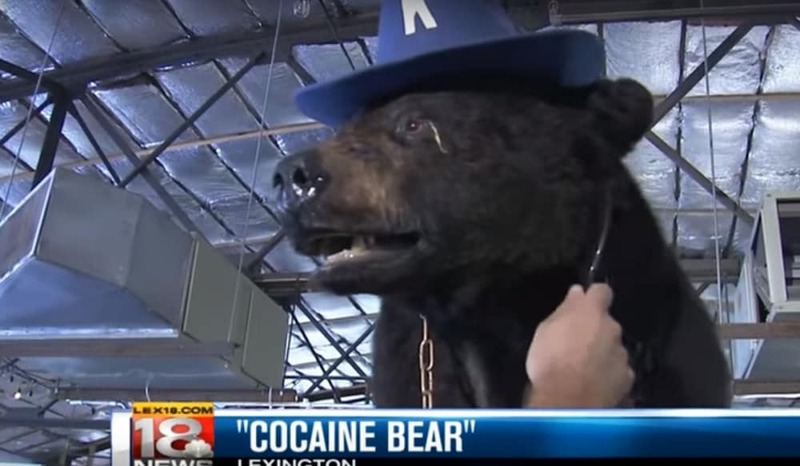 The stuffed cocaine bear switched hands a few more times after that – including being sold to country music legend Waylon Jennings – before finally settling in the Kentucky Fun Mall, located in northern Lexington. Do the first signs of winter have you feeling down? Well, don’t worry because even the deer are still having a hard time adjusting to the new frozen season. 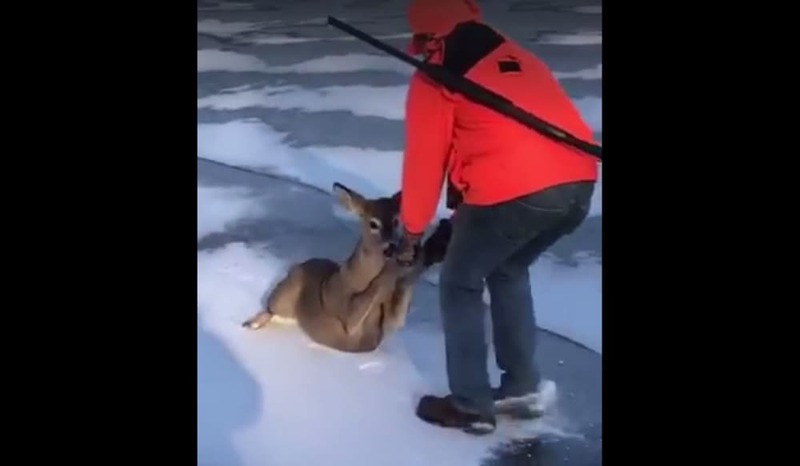 A hunter in Minnesota lend a helping hand to a young deer who hasn’t quite got the hang of walking on ice yet. See, deer don’t necessarily have the best grip with their hooves, so when this deer went down, he went down hard and couldn’t get back up. The hunter grabs a hold of the deer’s front hooves and pulled him all the way back to dry land. At first, the deer struggles to get its frozen legs back underneath him, but once he hits dry land, the deer scampers off to see another day. A visit to the crown jewel of the national wildlife refuge system, now under threat from Trump’s wall, reveals a harsh landscape teeming with life. The Santa Ana National Wildlife Refuge is a 3.3-square-mile tract of protected forest, wedged between the winding Rio Grande and the booming development of Alamo and McAllen. It’s a wild place at the intersection of desert, floodplain, scrub forest and jungle, where alluvial clay settles into sandy soils and where species at the edge of their ranges come together. Ninety-five percent of the region’s habitat is gone; Santa Ana remains. At least 400 species of birds have been sighted inside, and 450 kinds of plants grow here, pollinated by half of North America’s butterfly species. Charismatic rarities like ocelots, jaguarundi and indigo snakes move through the brush. What is Meant by Animal Rights? Every conscious being has interests that should be respected. No being who is conscious of being alive should be devalued to thinghood, dominated, used as a resource or a commodity. The crux of the idea known as animal rights is a movement to extend moral consideration to all conscious beings. Corporations and rivers now have rights. Animals are next. In a stunning move, India last month granted “living person” status to the Ganges and Yamuna rivers, making polluting the rivers akin to assaulting a human. A week earlier, New Zealand made the Whanganui River a “living entity” with legal rights. Sound crazy? Maybe less so when you remember that in the Citizens United and Hobby Lobby cases, the U.S. Supreme Court ruled companies are like people and have certain rights. If rivers and businesses have rights, why not animals, ask animal advocates excited by the river rulings. Existing animal welfare statutes, he says, “don’t provide recourse against the inherent cruelty of depriving self-aware, autonomous beings of their freedom, the company of others of their kind and their natural habitats.” His goal is to pry open the law. 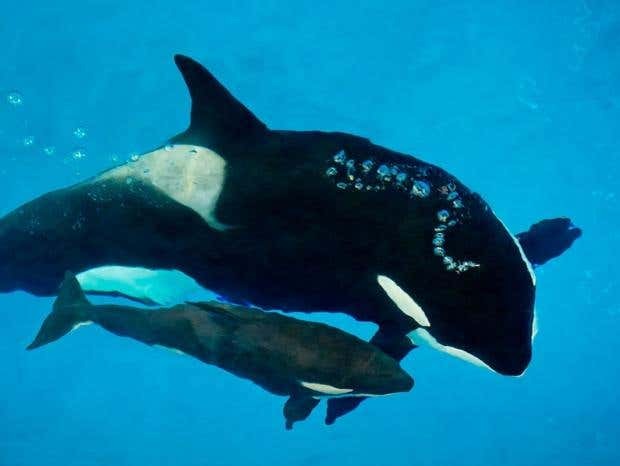 One success last year was the Oregon Supreme Court, contrary to the usual legal view, ruling that dogs are more than “property.” Nonjudicial successes included getting elephants out of the Ringling Bros. circus and killer whales out of Sea World, reflecting Americans’ changing attitudes toward captive animals. Achieving “rights” for animals is poised to be the next great social revolution, but no one is suggesting that animals get the right to vote or to drive. The “rights” would be limited, like those enjoyed by children. People for the Ethical Treatment of Animals is considered extremist by some, yet founder Ingrid Newkirk’s definition of “rights” is moderate: “The decent, commonsense idea that if a living being can suffer, whether child or Chihuahua, man or mouse, it is wrong to impose that suffering on them needlessly,” she tells me. Some animals do enjoy limited “rights,” says Wayne Pacelle, CEO of the Humane Society of the United States, “including not to be tortured or harmed in a malicious way. Others have the ‘right’ not to be confined in small cages and crates.” Achieving those protections was painful and slow. 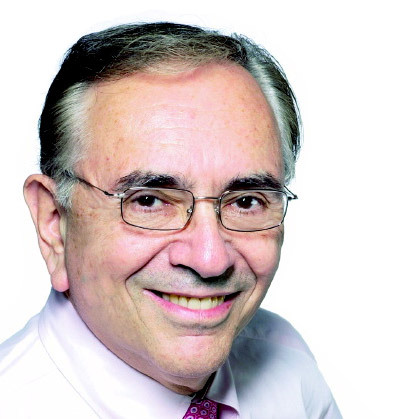 If “rights” were conferred, it would raise ethical considerations. Could we raise animals as food? Yes, we could, says Tara Zuardo, a lawyer for the Animal Welfare Institute. “There are countries like Germany that have animals written into the constitution, but they still raise animals for food,” using humane methods. “We predict that courts will increasingly issue decisions declaring that animals are not merely property and deserve certain legal rights,” she says. A 1992 amendment to the Swiss Constitution recognized animals as “beings” instead of “things,” and in 2008 a committee of the Spanish Parliament conferred legal rights on great apes. If a river has rights, how can they be denied to animals, which are sentient, and capable of feeling emotions such as joy, fear, loneliness? For decades, the Nonhuman Rights Project has been going to court to secure rights for chimpanzees, but it hasn’t yet achieved a breakthrough. It came close when it sued to have set free Leo and Hercules, two chimpanzees being held for research at Stony Brook University. The case stalled in 2015 when Stony Brook returned the chimps to the University of Louisiana, out of the court’s jurisdiction. PETA is in the U.S. Ninth Circuit Court of Appeals arguing that a chimp named Naruto holds the rights to pictures he took of himself using a camera set up and left in a forest. Sound crazy? As crazy as Ringling giving up elephants? Humans and chimpanzees share about 98 percent of the same DNA, and some humans have been freaked out ever since Charles Darwin wrote that humans are descended from apes. Opposition to animal “rights” is formidable. Social conservatives want no part of it, nor does the church, which teaches that man has dominion over beasts. Because animals lack reason, don’t have a sense of morality or an understanding of duties toward others, they can’t have rights, some say. But don’t we all know irrational humans who lack morality and shirk responsibility? Animal activists believe that the winning has begun. Forest fires have both awful and wonderful effects with respect to wild-animal suffering. Bad effects include killing many animals (sometimes in excruciating ways) and possibly spurring increased plant growth. A substantial good effect of forest fires is that they eliminate huge amounts of stored plant food that would otherwise have created tons of new animals. Burning alive is among the worst possible deaths. An animal that burns to death plausibly experiences a few times more pain than an animal dying in another way. This section includes some videos of burning bugs to help assess how bad burning deaths are. After fires in southwestern Alberta in 2002, which occurred long after breeding season, the Alberta Birds of Prey Society received about 10 great-horned owls to its clinic. “Their feathers had been singed off, and their skin was burnt,” says Weir. As for small mammals, a porcupine’s first response in the face of danger is to climb up trees. “That’s not overly useful in this situation,” says Zimmerling. “They’re not overly mobile.” Squirrels scurry to the very top branches, while burrowing animals can die if they don’t dig deep enough. “We may end up with animals cooking in the burrows unfortunately,” says Zimmerling. Mark Heathcott, a firefighter of 23 years in Banff National Park, recalls finding the body of a wolf that died during a controlled burn. “She panicked and tried to return to her den,” Heathcott says. Disturbances like fire may favor r-selected species in the short run, until slower maturing K-selected species are able to return to the affected area? Having a bigger proportion of shorter lived, higher mortality animals generally means more suffering. On the other hand, if total animal populations are lower in the immediate aftermath of fire, it’s not clear that fire increases the absolute abundance of r-selected animals. Combustion of organic material releases stored chemical energy that would otherwise feed enormous numbers of invertebrates and many vertebrates. Years’ worth of primary production is stored in large trees, and burning it away should thereby avert years’ worth of potential wild-animal suffering. This section includes some rough estimates of how much burning forest biomass may reduce bug populations in the future. Is it good to prevent forest fires? Preventing forest fires in the short run may lead to bigger fires in the long run. Still, if preventing forest fires does actually reduce total burning over the long run, then if forest fires are net good, preventing them is net bad. But there are two big “if”s in the previous sentence. Valid Sep. 1, 2017 through Aug. 31, 2018. Does not include feral hog (see Exotic Animals and Fowl). No closed season. These animals may be hunted at any time by any lawful means or methods on private property. Public hunting lands may have restrictions. A hunting license is required. ARMADILLOS: Possession and sale of live armadillos is unlawful. BOBCAT pelts sold, purchased, traded, transported or shipped out of state must have a pelt tag (CITES) attached. A pelt tag must be attached prior to being transported or shipped out of this state. Pelt tags may be obtained from any permitted bobcat pelt dealer, or TPWD Regional & Field Law Enforcement Offices. For additional information contact TPWD (800) 792-1112, menu 7, option 9 or (512) 389-4481. Live COYOTES are currently under a statewide rabies quarantine that prohibits them from being transported or sold in Texas (see exceptions). For information on the rabies quarantine, visit the Texas Department of State Health Services Infectious Disease Control Unit Web site. No person may possess a diamondback terrapin at any time. the person is visibly wearing at least 144 square inches of reflective material, both front and back. No person may use artificial light from a motor vehicle to locate, capture, or attempt to capture a reptile or amphibian. The take of any nongame species for commercial purposes (sale, offer for sale, barter, or exchange) from public lands or waters is unlawful. Provided the appropriate permit has been obtained, red-eared slider, common snapping turtle, and softshell turtle may be taken from private water for commercial purposes; however, the take or possession of any other species of turtle for commercial activity is unlawful. Many species of nongame wildlife may be sold, offered for sale, bartered, or exchanged, provided the proper nongame permit has been obtained from TPWD and all reporting and recordkeeping requirements are met; however, the collection from the wild, sale, offer for sale, or exchange of certain species of nongame wildlife is unlawful. A landowner or landowner’s agent may kill any nongame wildlife other than protected birds and threatened or endangered species (see below) at any time in any number, provided the wildlife is not taken into possession or used in a commercial activity. For more information on nongame regulations, permit requirements, and lists of lawful and prohibited species, contact TPWD at (800) 792-1112, menu 7 or (512) 389-4481 or go to Nongame Permits. An exotic animal is any animal that is not indigenous to Texas, including but not limited to feral hog, Russian boar, aoudad sheep, axis deer, elk, sika deer, fallow deer, red deer, and blackbuck and nilgai antelope. An exotic fowl is any avian species that is not indigenous to this state, including ratites (emu, ostrich, rhea, cassowary, etc.). Hunt an exotic without a valid hunting license. Hunt an exotic on a public road or right-of-way. Hunt an exotic without the landowner’s permission. Possess an exotic or the carcass of an exotic without the owner’s consent. Penalty: A person who violates these laws commits an offense. Hunting exotic wildlife without a license is a Class C misdemeanor ($25-$500 fine). The remaining listed offenses are Class A misdemeanors ($500-$4,000 and/or up to one year in jail). The Texas Animal Health Commission (TAHC) regulates the movement of feral swine for disease-control purposes. For more information please call TAHC at (800) 550-8242 or visit the TAHC Web site. No person may kill or attempt to injure a dangerous wild animal (African or Asiatic lion, tiger, leopard, cheetah, hyena, bear, elephant, wolf, or rhinoceros, or any subspecies or hybrid of these animals) that is held in captivity in this state or that is released from captivity in this state for the purpose of being killed, nor may any person conduct, promote, advertise, or assist in the hunting of a dangerous wild animal. It is unlawful for any person to hunt (see Definitions – Hunt) threatened, endangered, or protected nongame species. To sell or purchase goods made from threatened or endangered species, proper documentation must accompany the goods. For a complete list of threatened and endangered species, and regulations relating to breeding threatened and endangered species, please call (800) 792-1112 (menu 5). Protected Birds: Hawks, owls, eagles, and all other nongame birds and songbirds (except for the few unprotected birds listed below) are protected by various state and federal laws and may not be killed, taken from the nest, picked up, or possessed for any reason, and their feathers may not be possessed or sold. Arts and crafts may not include these protected species under any circumstances. The only birds not protected by any state or federal law are European starlings, English sparrows, feral rock doves(common pigeon, Columba livia) and Eurasian collared-doves; these species may be killed at any time, their nests or eggs destroyed, and their feathers may be possessed. Yellow-headed, red-winged, rusty, or Brewer’s blackbirds and all grackles, cowbirds (does not include cattle egret), crows, or magpies may be controlled without a federal or state depredation permit when found committing or about to commit depredations on ornamental or shade trees, agricultural crops, livestock, or wildlife, or when concentrated in numbers and in a manner that constitutes a health hazard or other nuisance. Bats: May not be hunted, killed, possessed, purchased or sold; however, bats may be moved, trapped, or killed if inside or on a building occupied by people. A person may transport a bat for the purpose of laboratory testing if there is a rabies concern. Black bears are protected and cannot be hunted or killed. Mountain lions are not protected and can be harvested at any time. Please report black bear sightings or mortalities, and mountain lion sightings, harvests, or mortalities to (512) 389-4505. It is unlawful (Class C misdemeanor) for any person, regardless of age, to possess certain nonindigenous snakes for commercial (Type 581) or recreational (Type 580) purposes if that person has not obtained a TPWD controlled exotic snake permit for that purpose. A controlled exotic snake is any species of venomous snakes not indigenous to Texas; African rock python (Python sebae); Asiatic rock python (Python molurus); green anaconda (Eunectes murinus); reticulated python (Python reticulatus); southern African python (Python natalensis), and includes ANY hybrid of these species. Permits may be purchased anywhere hunting and fishing licenses are sold. In addition, it is unlawful (Class A misdemeanor) to intentionally, knowingly, recklessly, or with criminal negligence release or allow the release from captivity of any of these snakes. Snakes possessed without the necessary permit may be seized, removed, and disposed of at the cost of the person possessing the snakes. Controlled exotic snakes are regulated under Parks and Wildlife Code, Chapter 43, Subchapter V, which may be enforced by any licensed Texas peace officer. For further information, call (800) 792-1112 (menu 7) or visit Frequently Asked Questions on Controlled Exotic Snakes. With a shake-shake-shake, this mother cheetah dries her rain-drenched fur—giving her cubs an accidental shower! Just about everywhere there are animals, there is rain. Some animals love it—or at least don’t mind it. But for many—including people—rain can be a bother. We have umbrellas and rain boots to keep us dry. Keep reading to find out how wild animals deal with downpours. Being caught in the rain isn’t just annoying. For some animals, getting soaked can be downright dangerous. Warm-blooded animals, including mammals and birds, need to keep their body temperatures steady. When rain soaks them to the skin, they may become too cold to survive. Luckily, they have coverings—either fur or feathers—that repel, or push away, water. By the time they are adults, most mammals have thick, stiff, slick fur. When raindrops fall on that fur, they roll right off—at least for a while. In a big storm, birds and mammals don’t rely only on their feathered or furry coats. An impala, for example, may flatten its ears to keep water out. A hippo may close its nostrils. And both birds and mammals can easily shed the water with a quick shake. The hippopotamus (above right) stands still and waits out a sudden storm. A thick layer of fat—not fur—keeps hippos warm even in pouring rain. The oily feathers on the black vultures (above left) help keep rain away from the birds’ skin. And thick fur lets along-tailed macaque (muh-KAK) ignore heavy rain (photo in circle). Falling raindrops can drown out the sound of a sneaky lion or other predator. So the impalas (top left photo) huddle together out in the open. This gives them a clear view of approaching threats. Oily feathers and thick fur make pretty good raincoats. But many animals would still rather not feel raindrops falling on their heads. So they find other ways of keeping dry. Butterflies and many other insects can’t fly in the rain. (Imagine being pelted by a bowling ball. That’s what a single raindrop feels like to a butterfly!) So they ride out storms by clinging to the undersides of leaves. A fox or wolf may find a cozy spot under a leafy shrub or in a cave. Mice or other small rodents might cuddle up together inside a hollow log. But what’s an animal to do when it needs to be on the go on a rainy day? Some just get wet, of course. But others do what we do: Use an umbrella or a rain hat! Orangutans make “hats” out of big leaves to protect their heads during downpours. (In zoos, they sometimes use cloth bags.) And a squirrel may flop its fluffy tail over its back and head. Sure, the tail gets wet, but the most important parts of the body stay nice and dry. Brrrr! A slushy mix of rain and snow drove this Eurasian lynx (above) under a rocky ledge. A furry coat keeps it warm, but that works only when the fur stays dry! Delicate insect wings don’t work when wet. So this dragonfly (top right photo) waits out a storm under a leaf. The squirrel (photo in circle) isn’t bothered by a little rain—not when its tail makes a perfectly good umbrella! The black-legged kittiwake (top left photo) uses her body to shelter her chicks from the rain. The chicks have feathers that are fuzzy, not slick. So they rely on Mom to keep them dry. Some animals ignore the rain. Others try to avoid it. And then there are those that love the wet stuff. For these animals, a rainy day brings a chance to mate, a fun mud bath, or a quick trip. Of all the rain-loving animals, the champion just might be the spadefoot toad. It lives in dry places and spends most of its life alone underground to keep its body moist. But when the rainy season starts, the toad party gets going. Spurred by the sound of thunder or rain, all the spadefoots in the area dig their way out to find each other. They quickly mate and lay eggs. Then they dig back into the ground to rest—and wait for the next big rain. The elephant family (above) wallows happily as a rainstorm turns a patch of dirt into an ooey, gooey mud puddle. 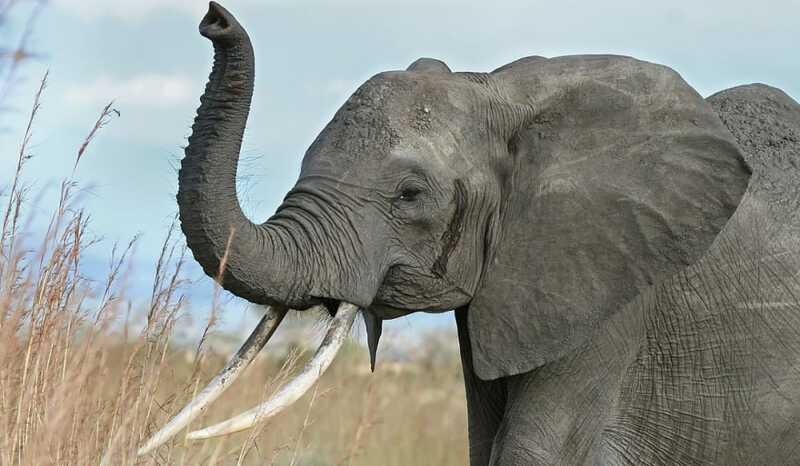 Mud helps elephants shed pesky pests. An earthworm (photo in circle) pokes out of the ground after a rainfall, and a spadefoot toad enjoys a refreshing soak after having spent several months underground. Rain, rain go away? No way! Rain, we hope you’ll stay! “It’s Raining!” originally appeared in the April 2014 issue of Ranger Rick magazine. OutdoorHub ReportersA hawk in Texas, bracing for Hurricane Harvey, hitched a ride with a Texas cab driver, and has become a hit on YouTube. Houston cab driver William Bruso made a series of 10 videos on YouTube after gaining the winged sidekick, who he says refused to leave after hopping in his car on Friday. Apparently, Bruso was stocking up on some survival supplies ahead of the catastrophic storm, when he returned to his vehicle to find the bird starring back at him from the passenger seat. 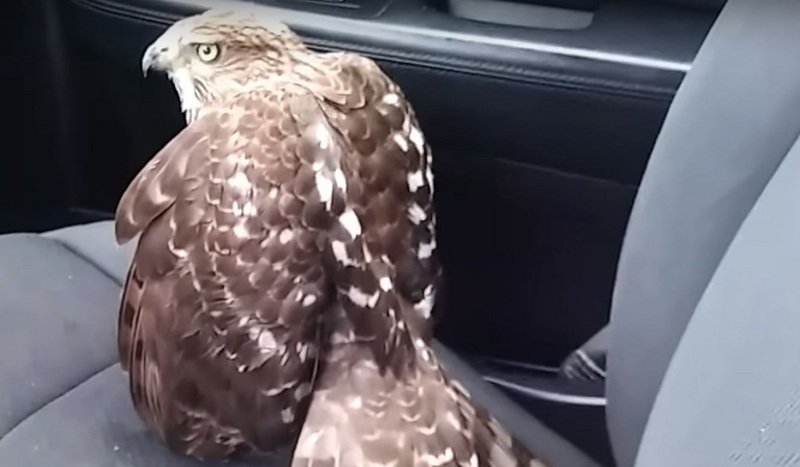 It was inevitable that this bird of prey refugee earned the nickname “Harvey the Hurricane Hawk” from Bruso, and the name seemed to stick after people started seeing the videos. 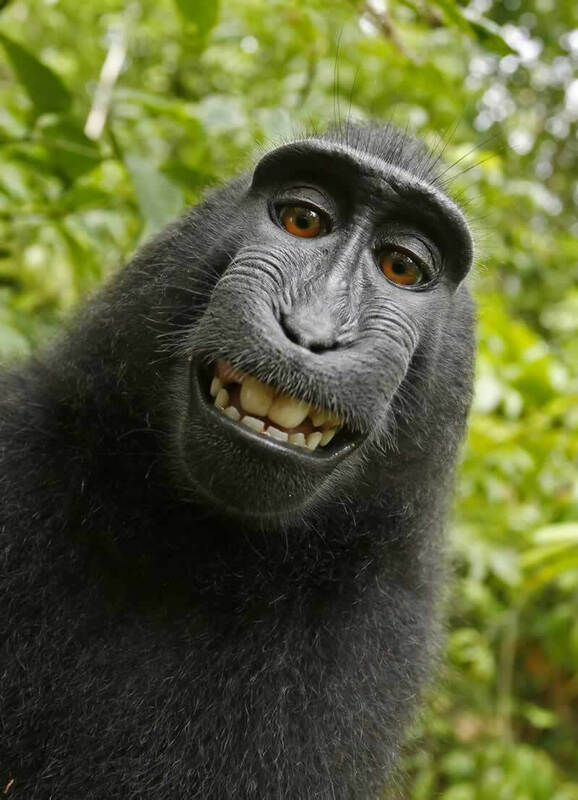 After roughly two years of court battles, the groundbreaking lawsuit asking a U.S. federal court to declare Naruto—a free-living crested macaque—the copyright owner of the internationally famous “monkey selfie” photographs has been settled. PETA; photographer David Slater; his company, Wildlife Personalities, Ltd.; and self-publishing platform Blurb, Inc., have reached a settlement of the “monkey selfie” litigation. As a part of the arrangement, Slater has agreed to donate 25 percent of any future revenue derived from using or selling the monkey selfies to charities that protect the habitat of Naruto and other crested macaques in Indonesia. General Counsel for PETA Jeff Kerr told the New York Times that he did not know how much money Slater made on the photos in the past, but also that PETA is glad Naruto will benefit from the images in the future. Naruto’s case sparked a massive international discussion about the need to extend fundamental rights to animals for their own sake—not in relation to the ways in which they can be exploited by humans. 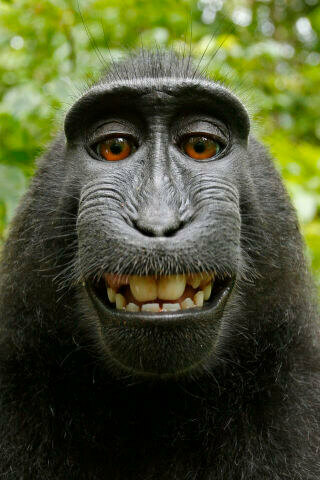 Naruto and the famous “monkey selfie” photographs that he undeniably took clearly demonstrate that he and his fellow macaques—like so many other animals—are highly intelligent, thinking, sophisticated beings worthy of having legal ownership of their own intellectual property and holding other rights as members of the legal community. Naruto’s case went all the way to a federal appeals court and shows that the struggle for animal rights is ingrained in our legal system. We’ll continue working in the courts to establish legal rights for animals. Everyone deserves the rights we hold dear: to live as they choose, to be with their families, to be free from abuse and suffering, and to benefit from their own creations. You can support our work to protect animals in need by making a gift today. Click here. assessing the longer-term needs of animals in partnership with the governments of affected states. The Prime Minister of Antigua and Barbuda described the devastation as “near total” and estimated upward of 95% of the structures on the island are damaged or destroyed.